Jeremy Saulnier has developed a well-deserved reputation as a writer and director of tense, well-made indie thrillers. 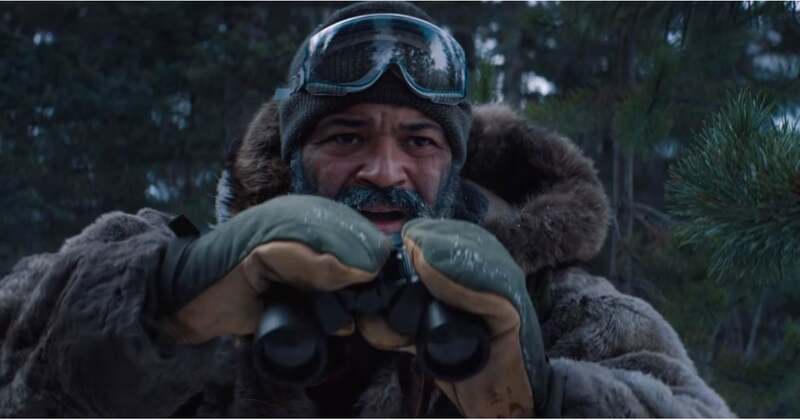 Hold the Dark, his fourth feature, has been adapted for the screen by his long-time collaborator Macon Blair (I Don’t Feel At Home in This World Anymore), and the film continues Saulnier’s tradition of delivering hard-hitting crime-based drama. This time around his financial backer is Netflix, so that’s good news for everyone. The film hits the streaming outlet on September 28, 2018. In the opening moments of the movie, a young boy in Alaska disappears without a trace. His mother, Medora Sloane (Riley Keough), suspects that her son is another victim in a series of attacks by a local pack of wolves. With the hope of preventing future incidents and gaining some measure of justice for her child, Medora contacts Russell Core (Jeffrey Wright), an expert in wildlife predators who has hunted down wolves in a similar situation and lived to write a book about it. Medora’s husband, Vernon (Alexander Skarsgard), has his own theory about his son’s disappearance and returns home from a deployment with the United States Army to seek his personal brand of closure. After you throw in an inquisitive local sheriff (James Badge Dale), some racial discord with the local Inuit residents, and bring the mixture to a steady boil, Hold the Dark careens in some unexpected, but satisfying, directions. To say anymore would spoil the fun. For those not familiar with Saulnier’s work, understand that the word fun may be a tad misleading for the uninitiated. Hold the Dark is no “feel good” movie. The director and his screenwriter enjoy exploring the evil that men do and the graphic consequences that may follow. Saulnier places his characters under intense pressure, and the audience watches as some implode and others explode into acts of terrifying violence. One of my critic acquaintances recently dubbed it “No Country for Cold Men”, and the comparison to the Coen Brothers’ crime classic is well-founded. I consider Saulnier’s Blue Ruin to be one of the best crime films of the last ten years. If you haven’t seen it, start there when you explore the director’s oeuvre. It’s an astounding look at the ways that violence perpetrated by one generation can infect the lives of the generations to follow. It unfolds like a perfectly made timepiece. The devil is in the details, and Saulnier uses the minutiae in his characters’ situations to build the suspense. And Macon Blair’s lead performance is nothing short of Oscar worthy, proving that he is a triple threat as an actor, director and screenwriter. Hold the Dark never reaches the dramatic heights that Blue Ruin achieves. Some of the character motivations get muddled along the way. I couldn’t help feeling that some of the characters react as they do because that’s what the plot needs them to do, not because that’s what the character would actually do. But that may be nit-picking on my part. Hold the Dark doesn’t feel as organic as Blue Ruin, but it’s a worthy addition to Saulnier’s filmography nonetheless. After four feature films, he seems like he can do no wrong. I’m looking forward to lucky Number Five.